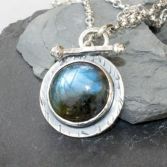 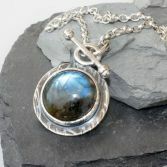 I have only made one of these necklaces and have tried to complement the beautiful Large Labradorite cabochon with an organic sterling silver setting. 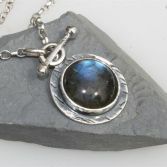 The Labradorite cabochon is really stunning with king fisher blue flashes on the front and the back of the stone. 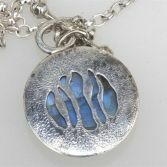 I just had to show off the back also which is why i cut out a design on the reverse side also. 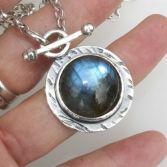 The pendant element measures 35mm by 27mm and has been hung on a strong sterling silver belcher chain with links that measure 3.5mm by 4.5mm. 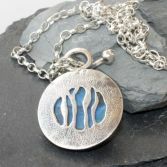 The pendant fastens with a large bar at the front which pushes through the think circle part of the pendant. 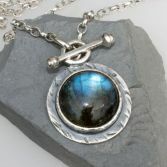 It is very secure yet easy to put on and off and can be worn both ways. 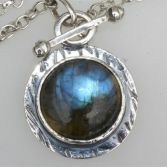 The length of the necklace is 18.5'' inches. Your Large Labradorite Pendant will be presented in one of my signature gift boxes and posted 1st class recorded delivery via Royal Mail Free of charge to any UK address. You will receive the pendant shown in the images as its a one of a kind.